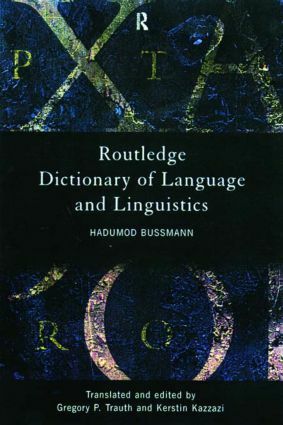 The Routledge Dictionary of Language and Linguistics is a unique reference work for students and teachers of linguistics. The highly regarded second edition of the Lexikon der Sprachwissenschaft by Hadumod Bussmann has been specifically adapted by a team of over thirty specialist linguists to form the most comprehensive and up-to-date work of its kind in the English language. In over 2,500 entries, the Dictionary provides an exhaustive survey of the key terminology and languages of more than 30 subdisciplines of linguistics. With its term-based approach and emphasis on clear analysis, it complements perfectly Routledge's established range of reference material in the field of linguistics. Applied linguistics, artificial intelligence, basic terminology, computational linguistics, conversational analysis, discourse analysis, grammar, graphemics, history of language, language change, languages, linguistics schools, logics, morphology, neurolinguistics, phonetics, phonology, pragmatics, psycholinguistics, rhetoric, semantics, semiotics, sociolinguistics, stylistics, syntax, text linguistics, transformational grammar, typology, universals.